The government borrowed another £4.3bn last month to plug the growing hole in the UK's finances, figures show. It is the first time the government has borrowed money in January - usually a bumper month for income from tax receipts - since records began in 1993. Andrew Goodwin, senior economic adviser to the Ernst & Young ITEM Club, called the figures "pretty ghastly". The UK's total borrowing for the financial year now totals more than £122bn. January's borrowing figure, released by the Office for National Statistics, came as surprise to many economists. They had expected to see a surplus in January's budget, allowing it to repay around £2.8bn of its debts. But levels of income tax and capital gains tax received by the government were significantly lower than in previous years, the ONS said. 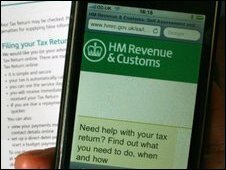 Tax receipts dropped 11.8% compared with January last year, when the government was able to repay £5.3bn. "These are pretty ghastly figures and come as somewhat of a surprise," said Andrew Goodwin, senior economic adviser to the Ernst & Young Item Club. "January usually yields a healthy surplus due to receipts from corporation tax and, even in the current climate, it is surprising to see the government rack up a deficit." The sorry story of the public finances has reached another depressing chapter. Self-assessment tax payments usually surge into government coffers in January so it should be a month when receipts exceed spending. But not this time, even with a rise in VAT. The recession has wreaked havoc with government finances in all the leading industrialised nations - but even so the UK's annual deficit is one of the highest. Total borrowing for the financial year to date is now running at more than £122bn. The chancellor's forecast for the full year, on a comparable basis, is £170bn. A Treasury source argued that they were on track to meet that forecast. The hope is that factors like lower-than-expected unemployment will offset the predicted fall in tax revenues. Even so fingers will be crossed in the Treasury right up till Budget Day. He added that the challenge of balancing the country's books was now even more apparent. Chancellor Alistair Darling recently came under pressure from a number of leading economists to act more quickly in cutting the size of the budget deficit. The government expects public sector borrowing to peak at £178bn this year - equivalent to 12.6% of GDP. Mr Darling has pledged to halve that deficit in percentage terms over the next four years, but argues that making cuts sooner could harm the UK's recovery from recession. Shadow chief secretary to the Treasury Philip Hammond called the latest figures "appalling", adding that total UK borrowing so far this year was equivalent to £4,800 for every British family. Business groups echoed calls for "a credible plan" from the government for curbing the deficit. The British Chambers of Commerce said a failure to act more quickly was putting the UK's credit rating at risk. "As well as explicitly spelling out its medium-term spending plans, it is now necessary for the government to announce a freeze in the public sector wage bill, and an immediate review into the cost of public sector pensions," said David Kern, the BCC's chief economist.